When I was growing up, my mother could not do the laundry because the two-tub washer was in the basement and she had rheumatoid arthritis. She was confined to a wheelchair many times in her life. One of my brothers or I did the washing. About this time the automatic washer was brought onto the market. It was new and had to be bolted to the floor because it would spin vertically rather than horizontally. Dad found a place on the main floor where he could bolt it down. I still did the washing even though Mom could get to it easier. We had no dryer so the clothes had to be hung out. We had a line mounted on pulleys so that I could stand in one place and hang all the clothes. 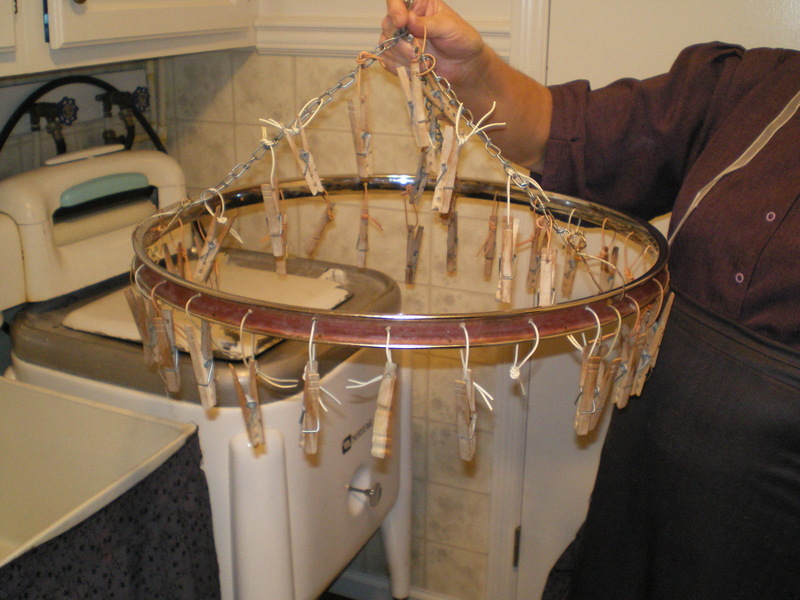 My Pennsylvania Amish friend showing me how she does laundry with her old-fashioned wringer washer. 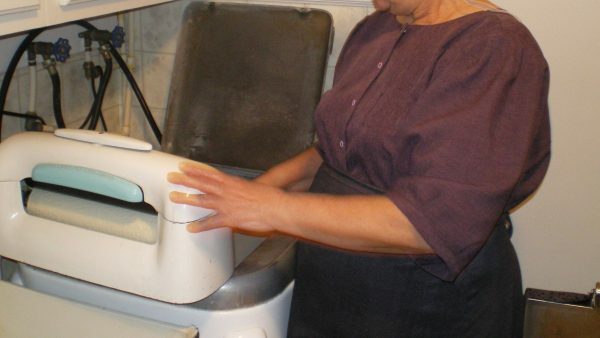 She bought a house from an Englischer, so she has electricity and just plugs the washer in! Since I brought up the washing let me tell you about the old washing machines. Many Amish use this kind of washing machine and power it with a gas-powered generator. The machine usually consisted of two tubs attached with a wringer between them. Each had an agitator in the bottom. Each step would have to be started and stopped by the user. Nothing was automatic. I would put the laundry into the first tub along with the detergent and then turn it on. The tub would fill with water and then the agitator would start turning. It would run for a short time, fifteen or twenty minutes, then it would stop, and the water would drain out. I would then feed the clothes, one at a time, into the wringer. The wringer squeezed out the water and the article of clothing would fall into the other tub. This tub would be filled with clean rinse water. After all of the laundry had gone through the wringer and into the rinse, I’d start the agitator and it would rinse everything. After an appropriate amount of time, I’d put the clothes back through the ringer to squeeze the clean water out. I’d collect the wet laundry in a clothes basket, take it to the clothesline, and hang it up to dry. Then, of course, after drying, it had to be removed from the line, folded and put away. It was an all-day job. This is how my Amish friend dries her small articles of clothing: underwear and such. I remember helping with wash using a wringer washing machine. I was allowed to help with ironing the flat pieces. My sister said when my twin and I were born,mom had to do the wash in a wringer including two sets of diapers. Dad would help before he went to work. No dryer too. Marion, I never had to used the old wringer washer, but my mom used cloth diapers on all us kids. I was one of the oldest, so I washed a lot of cloth diapers! I can remember using a wringer washer….hanging the clothes and diapers outside…even in the winter…Sometimes they would be frozen stiff! 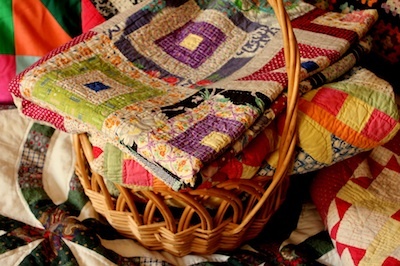 Then I would drape them all over the house to continue drying…I actually liked the wringer washer. My mom had a wringer washer when we were kids. We started helping by about age 6. There were 6 of us kids plus our parents. My dad always wore overalls and they were so heavy when wet to reach up and hang on the line. We used this washer and hung clothes on the line until we graduated high school. I am a twin and we are the youngest in our family. By the time we graduated all of the other kids had moved out. Dad finally bought a nicer automatic washer and dryer. Mom told us she used cloth diapers and one time was down to 2 clean diapers and waiting on the others to dry on the line. She said she was hoping they were dry by the time they were needed. In the winter, we would put the clothes in baskets and after supper load all of us and the clothes to go the the laundrymat. We only had one car so we had to wait until Dad got home from work to go. Of course I remember getting my fingers nipped more than once with the wringer. I am reading these comments: My mom……. It makes me feel old. 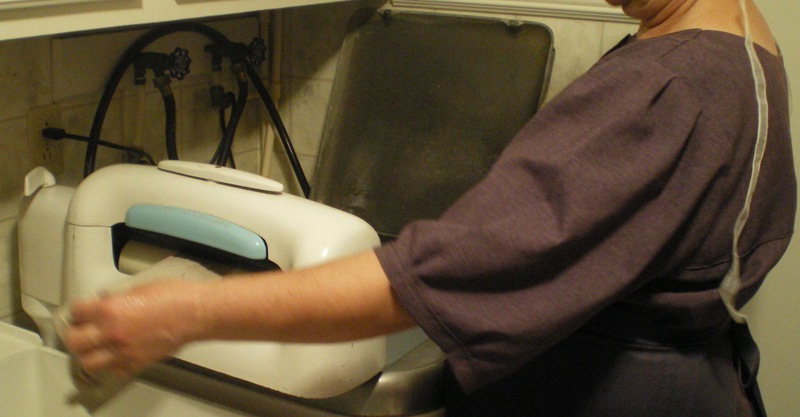 I used a wringer washer for many years. My husband and I moved into a house that had one. Beats buying a washer! I loved it. It was great for baby clothes because you could time it however you wished. I hand-rinsed from a basement tub. I am glad I had the experience.